I wanted to share with SWMTU members this letter. 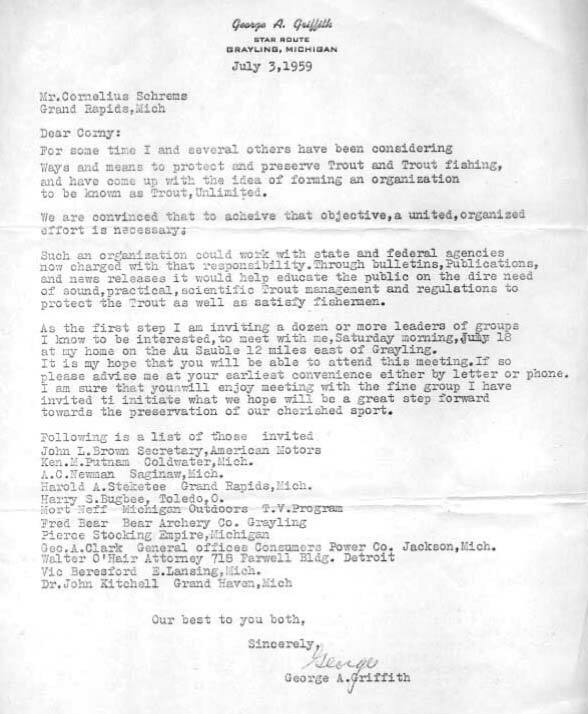 This is a copy of the original letter of the first recognized meeting by the founding members of Trout Unlimited. July 15th is considered by national as TU Day which was founded in 1959 in Grayling, Michigan. I have a collection of some original documents in my possession that I received a few years ago while serving as a member of West Michigan Trout Unlimited. I became friends with Cornelius Schrems wife, “Sis,” and stayed in touch with her until she passed away. Sis created a yearly scholarship fund through Michigan State University for a recognized student who is interested in pursuing studies in fish management and biology, an on-going program she made available in memory of her late husband, Cornelius. I hope you find this of some interest. Note the July date on this for the gathering of original members.